Redistricting for the U.S. House of Representatives is not a unified process, as is the case for most national legislatures. Rather, it's the result of the cumulative actions of the states that have more than one representative. Nevertheless, it is useful to look at the entire House to see how the decisions in the states combine to form a fair or an unfair playing field for the parties. The findings below indicate that between 1972 and 2010, there was only a very slight overall partisan bias toward Democrats in redistricting. Toward the start of this period, Democrats had a large advantage, but by the 1990s it had become relatively small. Since 2002, the partisan bias in redistricting has shifted in favor of Republicans to a large degree. Looking forward from the 2012 election result, this research finds that Democrats would have to get around 53% of the two-party national House vote to have a shot at winning a majority in the lower chamber. 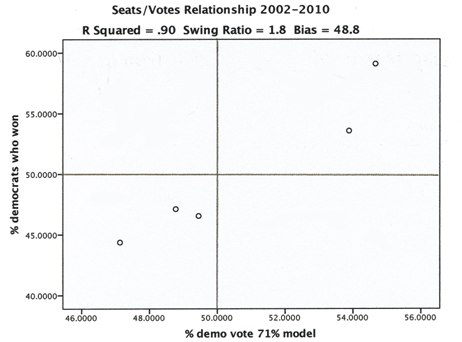 The most commonly used method for analyzing the partisan nature of the redistricting process is the seats/votes relationship (see here 1 for a longer discussion). For this analysis, simple least squares 2 regression is used to relate the percentage of the two-party votes that Democrats received to the percentage of the seats that they won. The Pearson's R2 tells us how strongly the allocation of seats is related to the votes received by each party. The slope of the regression line is called the swing ratio, and tells us how responsive the system is to changes in the vote. One can determine the partisan bias of the redistricting outcome by simply solving the regression equation for the situation in which Democrats receive 50% of the votes. At that level they should also win about 50% of the seats if the playing field is level. Determining the percentage of the two-party votes received by Democratic candidates for the House requires attention to two questions. The first question is how to count elections in a state like Georgia, which has majority vote requirements -- sometimes necessitating run-offs -- and elections in which all the candidates in the general election run in the same primary, as in the new system used in California. If there was no run-off election between a Democrat and a Republican in a state that has them, I counted the first election as the election. The Democratic vote in such elections is the total vote for all Democratic candidates, and the Republican vote is the vote for all Republican candidates. If there is a run-off election between a Democrat and a Republican, I counted that as the election. If both candidates in the general election are in the same party, I counted that as an unopposed election for that party's winning candidate. A second question is what to do with unopposed contests. I define an opposed contest as one in which both a Republican and a Democratic were on the ballot. If the vote in unopposed contests is included, the total for the party that had the most unopposed candidates is inflated, because their opponents would have received at least some votes. If the vote of the unopposed candidates is excluded, the vote of the party with the most unopposed candidates is understated because unopposed candidates would undoubtedly receive a substantial majority of the votes if they were opposed. One way to deal with this problem is to substitute the vote of some other set of candidates in districts where the congressional candidate is unopposed. But on a nationwide basis, the only office available for that job is the presidency, and that is only available in half the congressional elections. Moreover, this is exactly the wrong office to use. There is great variation in presidential and congressional voting as shown by Barry Burden and David Kimball in their book 3 Why Americans Split Their Tickets. Votes for U.S. Senate or governor could be substituted into unopposed races, but this also has problems. Voters typically know more about candidates for these offices; only 33 or 34 of the states have a Senate election in any year; and most governors now have four-year terms. The two-party voter turnout in unopposed districts is assumed to be equal to the mean turnout in opposed contests. This is designated as “m” in the formula. This is a reasonable assumption 4. Gary Jacobson estimates 5 the percentage of the vote that we would expect unopposed candidates would have received, on average, if they had been opposed (“v” in the formula) at 71% with a standard deviation of 10%. His analysis is based on the support that congressional candidates received in the election following or preceding the one in which he or she was not opposed. With this calculation, I derived the percentage of the two-party vote that Democrats received in recent elections. These figures deviate little from other measures of the “Total Vote” without this adjustment. The logical place to start the analysis is the 1972 election, which is the beginning of the first redistricting cycle after the U.S. Supreme Court required congressional districts to follow the principle 6 of “one man, one vote.” In the period from 1972 to 2012, only in 1996 and 2012 did the party that received the most votes fail to receive the most seats in the House. In 1996, Democrats received 50.02% of the two-party vote (adjusted), but failed to retake the House from the GOP. In 2012, Democrats received 50.6% of the two-party vote, but again failed to retake the House. Given the power of incumbency, the “out” party may need to get well over 50% of the two-party vote to take over the house even if there is no gerrymandering. Republicans received 54.5% of the two-party vote in 1994 to take over the House, and Democrats took it back in 2006 with 53.9%. Republicans took it back again in 2010 with 52.9%. Table 1 above shows the pertinent figures for the entire period and for the four most recent redistricting cycles. The adjusted 7 R2 results indicate that the allocation of seats is consistently related to the votes cast, both for the whole period and each decade. 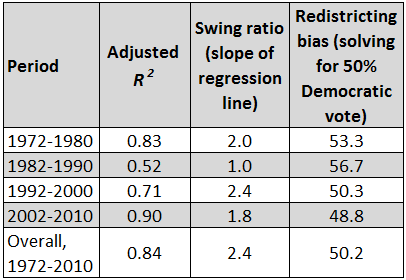 For this entire time and for all four redistricting cycles, the swing ratio has been appropriately at or above 1.0, indicating the expected advantage for whichever party has a majority. Over the entire period the system has had little partisan bias -- a Democratic advantage of only 0.2%, which means about eight or nine additional Democratic seats if the vote were evenly split. At the beginning of this period Democrats had a sizable advantage, but in more recent elections this advantage has shifted from little bias in the 1990s, to a sizable Republican advantage starting in 2002 (Figure 1 below shows the relationship for the 2002-2010 period graphically). The more recent Republican advantage may be due to the requirements of the Voting Rights Act (VRA) to create majority-minority districts, thus artificially packing many of the most reliable Democratic voters in a few districts. The high point of this requirement, however, was in the 1990s. Thus the VRA is not inconsistent with unbiased redistricting or a pattern that retains a small Democratic bias. 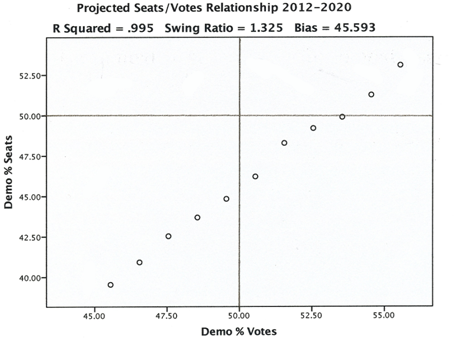 A rough estimate of the bias for the 2012-2020 decade can be made using this same seats/vote relationship by extrapolating from the vote in the 2012 election and assuming that any change in the vote in future elections will be uniform across all 435 districts. This assumption is not warranted, as some districts will change more than others. We would expect the most change in open seats. But the party vote does tend to go up and down in unison in most places. A good year for one party tends to be a good year for that party everywhere, relatively speaking. Such an analysis is not so much a prediction as a measure of a gerrymander based on the evidence at hand at this early date. As shown below in Figure 2, I have adjusted the 2012 Democratic percentage of the two-party vote in all districts up and down by one percentage point at a time to simulate elections where Democrats receive only 46% of the vote up to the point where they receive 56%. This is the historic range. The bias is more severe than in the past decade. If Democrats get 50% of the two-party vote, they would only get 45% or 46% of the seats. To get half the seats, Democrats will have to garner about 53% of the two-party vote. This is not impossible, as they performed above this level in 2006 and 2008, but it makes the task of winning a majority of the House seats an uphill climb. Theodore S. Arrington is Emeritus Professor of Political Science at the University of North Carolina at Charlotte. He has been an expert witness in over 40 voting rights cases in the United States and Canada, and his commentary is frequently heard on television and radio and cited in newspapers.